We like constructing a portfolio with a healthy dose of diversified and high-quality carrying assets, with U.S. investment-grade credit and securitized assets being a sweet spot for these expressions. We like owning EM assets tactically, while being highly selective with regard to specific idiosyncratic stories. Equities could benefit markedly from today's lower risk-free and corporate discount rates, versus late last year, and could very well enjoy multiple expansion as a result. On the eve of World War II, the British government propagandized the iconic slogan keep calm and carry on, described by Wikipedia as "evocative of the Victorian belief in British stoicism-the "stiff upper lip," self-discipline, fortitude, and remaining calm in adversity." We've adopted a similar mantra in 2019 as we endeavor to keep calm in the face of stubborn Brexit drama, and more importantly in the face of a persistent hyperbolic financial market narrative that unnecessarily emphasizes global economic left-tail risks. Financial markets have endured significant turbulence in recent months as the market-implied forward monetary policy path pivoted from overtly hawkish late last year to ambitiously dovish more recently. The irony is that despite some modest ebb and flow in aggregate global economic indicators during this period, the global economy is enjoying some of the greatest stability in history, notwithstanding specific pockets of weakness, like European manufacturing and emerging markets. Thus, there is enough core economic stability overall to warrant holding higher-quality risky assets, in our view, so we are positioned to "keep quality and carry on." As for the remarkable global economic stability we're witnessing, relative to history, we've been very vocal about the powerful secular evolution away from a dependence on the production and consumption of goods, to a far more services-dominated global economy. The inelasticity of supply at the right side of the goods cost curve is what has historically exaggerated the amplitude of the business cycle. In contrast, a services-led economy enjoys ample elasticity on the expansionary side of its supply curve because the marginal cost of production is limited to the marginal price that the marginal worker is willing to pay. Ultimately, this is represented by their marginal disposable income. 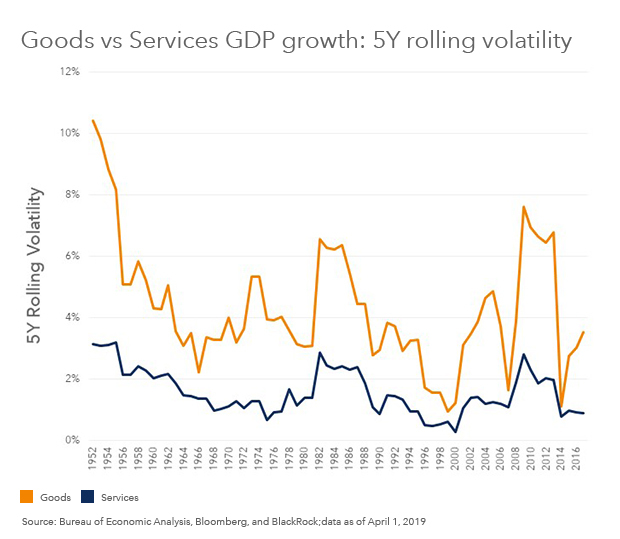 Thus, a services-dominated economy is structurally less volatile than one that is goods-dominated (see graph). Concurrently, while conventional wisdom views the ECB as increasingly ill-equipped to fend off structural economic weakness, due to a lack of effective new policy tools, we see room for policy innovation. Indeed, we think the ECB can aspire to reduce the European corporate sector's uncompetitive ratio of systemic cost-of-capital to GDP growth. Specifically, while Euro-area weighted average cost-of-capital (WACC) is about 100 basis points below that seen in the U.S., its growth rate is almost 180 basis points lower. Since it would be nearly impossible to reduce Euro-area cost of debt from the currently extraordinary low levels, the ECB could choose to restore a competitive equilibrium through attempting to lower the cost of equity capital instead, by adding equities to its balance sheet via a new round of quantitative easing. Thus, the ECB too has incremental policy levers to pull if conditions warranted. Putting it all together, we like constructing a portfolio with a healthy dose of diversified and high-quality carrying assets, with U.S. investment-grade credit and securitized assets being a sweet spot for these expressions. We like owning EM assets tactically, while being highly selective with regard to specific idiosyncratic stories. Equities could benefit markedly from today's lower risk-free and corporate discount rates, versus late last year, and could very well enjoy multiple expansion as a result. Finally, as we've been vocal about all year, we like employing duration as an overall portfolio hedge given the Fed's new pragmatic posture.